So today I worked on a few commissions and also meant to get some work done on my Death Guard army. The new edition of 40k as well as the new Chaos Codex looming on the horizon has motivated me to finish off the last 3 terminators I have had sitting around for close to 2 years now. I also have some traitor guard, a blight drone and about 15 more plague marines if I want them, although I already have 21 painted up for my army and those guys eat up a lot of points. I had started work on my next Terminator when I saw this one plague marine painted up in pre-heresy colors sitting off to the side. 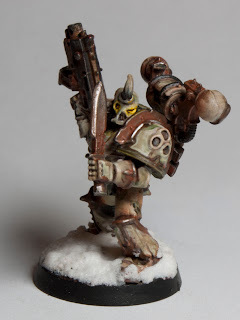 Way back in 2009 when I restarted this army (my death guard date back to 2005ish but the current paint scheme started in '09) I painted up 2 test models. One in the traditional green that I went with and the other a dirty white. This was back before washes or foundation paints and I hadn't even heard of weathering powders yet. It ended up not looking very good plus my demons were already painted an off white color and I wanted some variety in my army's color scheme. The other day I decided I was going to give the green and white scheme another shot just for fun and gave him a base of dheneb stone with a devlan mud wash and then set him aside to work on real projects. For some reason today the model called to me so I went about finishing it. I didn't even mean to base him or give him a backpack but ended up liking the model enough that I felt it warranted it. This guy was quick and dirty and I really spent no time being precise on him at all, but I think it helped in the end. He is by no means display quality, but an army of these on the table top would look pretty intimidating in my opinion. I decided against painting all of the trim green. I figured only the shoulder guards were green to start with and as they bolted on more decorative trim as they fell into chaos they wouldn't have bothered painting it. 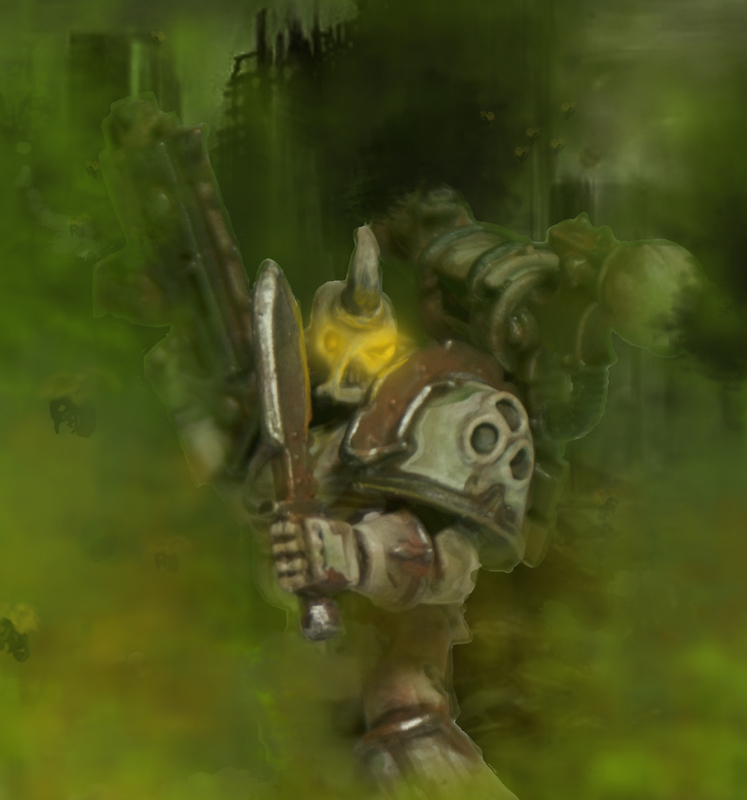 I feel like it kind of shows the original Death Guard colors slowly transitioning to what we now know in 40k. I made heavy use of weathering powders and washes (either self made or out of the bottle). 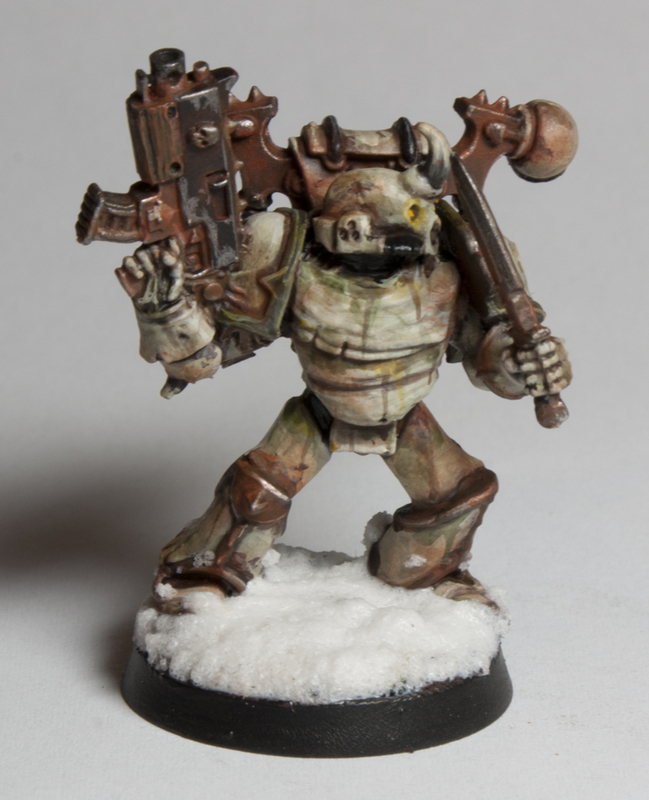 I gave him a snow base because it was quick, it easily covered up the previous base, and the pristine white of the snow contrasts nicely with his decrepit armor. Let me know what you think. 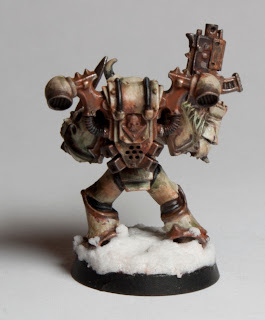 I don't have any future plans for this scheme, my Death Guard are sticking with their green and metal, although I am adding in some weathering powders to them as well.